The white blood cell (WBC) count may be markedly elevated to levels of 20,000/μL or greater. Usually, a shift to the left is noted. In late septic shock, the WBC count may be low. Urinalysis may demonstrate gross hematuria, red blood cell casts, and proteinuria. Rapid urine dipstick tests have been developed to screen for Yersiniapestis antigen and can be used in the field for rapid identification during outbreak situations. Arterial blood gas level may reveal hypoxia and/or acidosis. Gram stain may identify the gram-negative, pleomorphic coccobacillus. Gram stain can be performed on bubo aspirate, sputum, and blood. In 70% of patients, the gram-negative, bipolar-stained coccobacillus is visualized if present. When stained with Wayson or Giemsa stain, a bipolar safety pin structure may be identified. While Wright stain often demonstrates this characteristic appearance, shown in the image below, Giemsa and Wayson stains most consistently highlight this pattern. 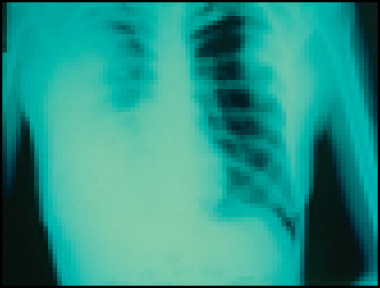 In patients with pneumonic plague, chest radiographs typically show alveolar infiltrates, with or without hilar lymphadenopathy. Bilateral consolidation may be evidenced. The radiograph below shows a patient with plague pneumonia. Specialized diagnostic testing is available at some laboratories, such as state health departments or the Centers for Disease Control and Prevention (CDC). This stain is performed on blood, sputum, or bubo aspirate samples. It may provide rapid diagnosis if available. If unavailable, send specimens to the CDC, Plague Branch, PO Box 2087, Fort Collins, CO 80522. Acute and convalescent passive hemagglutination (PHA) titers should be taken 10 days apart. A 4-fold difference or a single convalescent PHA titer of 1:16 is evidence of infection. 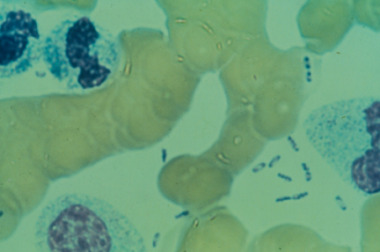 The diagnosis may be made by Gram stain and culture of the aspirate. One may attempt aspiration even if the lymph node is hard and nonfluctuant. Infusion of 1-3 mL of normal saline in the aspiration site prior to aspiration may prove beneficial. Strict contact and respiratory precautions must be practiced to avoid spreading this highly contagious agent.